An internationally known specialist in rare and diffuse lung diseases in children, Robin Deterding, MD, was drawn to medicine by curiosity about science and a passion for helping others. Her primary role models were her family of educators and she became the first physician in her family. Pulmonary medicine attracted her because of the dual nature of its practice, in the clinic and in the ICU. At different times, the focus of her career would shift from that of a scientist, a clinician, and an academician. True to family tradition, she cares deeply about mentoring and developing students and trainees. As past associate dean of clinical curriculum at the University of Colorado School of Medicine, for instance, she oversaw the creation of the school’s new curriculum for undergraduates. Earlier in her career she worked on translational research focused on pulmonary fibrosis and lung development. Today she is focused on issues of clinical care, in particular, improving health outcomes through innovation. “Robin does not tolerate the status quo,” says Emily DeBoer, MD, one of her long-time mentees. “She is constantly questioning common practices and persistently pushing us to think bigger than people have thought before.” These original ideas include developments like new drugs, devices, diagnostics, digital health technologies, and other novel approaches. 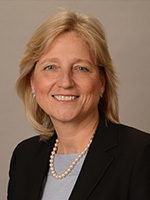 Dr. Deterding’s current roles at Children’s Hospital of Colorado include: the Ed and Roxanne Fie Anderson Family Endowed Chair for Breathing, professor of pediatrics, chief of Pediatric Pulmonary Medicine, and medical director of both The Breathing Institute, an interdisciplinary unit, as well as Children’s Hospital Colorado Innovation Center, a health care innovation and biotechnology accelerator. The center, which was established in 2016, already has one executed contract to develop a new health care product. It is this possibility of improving a child’s future that is one of Dr. Deterding’s key drivers. To better organize research for rare diseases, she established two nonprofits, connecting patients and researchers. At the Children’s Interstitial Lung Disease Research Network (ChILDRN), she is co-leading efforts to develop an international diffuse lung disease database. In addition to co-founding the chILD Foundation, she steered several of the organization’s early initiatives. In 2016, she was among the investigators who received a bioengineering/information technology grant from the State of Colorado to create a personalized pediatric device to optimize lung disease management. Now through 2018, her goal is to help design a software application and device, the grant’s minimal viable product. Breathing difficulty is the predominant abnormality for children and at Dr. Deterding’s current hospital (Children’s Colorado), as many as 25 percent of children who are discharged have some type of respiratory-related diagnosis. Pediatric pulmonary medicine has distinct challenges and barriers to care. A main point of concern for Dr. Deterding is oxygen therapy. Existing insurance plans use adult guidelines because no guidelines exist for the unique needs of children. “Kids aren’t little adults!,” she says. She is co-chairing the first set of medical guidelines for proper supplemental oxygen levels in children, “Clinical Practice Guidelines for Chronic Supplemental Oxygen in Children,” with the support of an ATS documents grant. Dr. Deterding has a growing list of accolades, as an educator and clinician. In 2015, she was recognized with an ATS Public Advisory Roundtable (PAR) Excellence Award, honoring individuals who improve the lives of patients. She remains engaged in PAR efforts, presenting at in-field opportunities like the Meet-the-Experts Forum at the American Thoracic Society 2016 International Conference in San Francisco, California, as well as live webinars for various Lung Disease Week observances. She has extensive volunteer experience with the ATS Pediatrics Assembly and has served in leadership positions, including chair. The ATS is her academic home, and as the largest pulmonary, critical care, and sleep society, she considers it the central vehicle to help shape the future of lung health. Like the Society, Dr. Deterding’s impact goes beyond her local community; it extends nationally and internationally. A connector and radical innovator, she believes the field should do more to prevent lung disease and promote long-term lung health. “We need to own this issue,” she says, “so that we can change the trajectory forever.” The opportunity is apparent—low lung volume in childhood can persists into adulthood and even worsen with environmental exposures. Her life’s work is dedicated to this inexorable link between child and adult lung health. Between her two children’s sporting events, and her own active lifestyle in the Colorado outdoors, Dr. Deterding keeps a busy schedule on and off the clock.